Corporate Assets Inc. | Steel Components Metal Products Inc. - Corporate Assets Inc.
Steel Components Metal Products Inc.
LARGE OFFERING OF FABRICATING EQUIPMENT, TUBE BENDING, WIRE STRAIGHTENING, STAMPING AND WOOD WORKING EQUIPMENT FEATURING: EUROMAC (2005) MTX 1250/30 INDEX 30 ton CNC hydraulic punching system; STRIPPIT 1250-30-1500 FABRICENTER 30 ton CNC turret punch; AZTECH A89 25 ton X 4' hydraulic press brake; CURVATUBI (2000) STAR 650/800CN3G 3 axis CNC tube bender; AIM (2001) ACCUFORM AF-2D1-P5 2 dimensional CNC wire forming machine; MOTOMAN robotic welding system; NIAGARA HD-175-8-10 hydraulic press brake; ACCURPRESS 717512 hydraulic press brake; ACCURPRESS 760-8 hydraulic press brake; PIRANAH 65 ton X 8' hydraulic press brake; ALLSTEEL 45 ton X 8' hydraulic press brake; PALTECH 40 ton X 8' hydraulic press brake; PALTECH 40-6 40 ton X 6' hydraulic press brake; AZTECH A89 25 ton X 4' hydraulic press brake; STRIPPIT CUSTOM 30/30 sheet metal fabricator; GASPARINI CO 3004 10' X .187" hydraulic shear; DURMAZLAR (1998) JDHGM 3006 10' X .250" hydraulic shear; PEXTO 298-C 20 ga. circle shear; ERCOLINA SUPER BENDER 2" dia. X .140" wall cap. 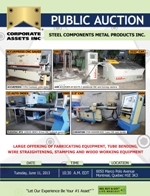 rotary draw tube bender; NATIONAL NR4816 bending rolls; SCOTCHMAN FI-85-140 85 ton hydraulic ironworker; PEMSERTER SERIES 4 4 ton insertion press; LITTLE BLASTER (2003) LB 4024-3 shot blast cabinet; PINES vertical tube bender; PEDRAZZOLI 1.5" cap. tube bender; HYD-MECH S20A automatic horizontal band saw; VERTICUT roll in type vertical band saw; EISEL VMS4PV cold saw; 10+ OBI presses ranging from 40 ton to 150 ton and air clutch; 10+ press feeders and uncoilers up to 5000LBS capacity; (5) SCHUSTER & LEWIS wire straighteners & cut-offs 3/8" and 5/16" capacity; MILLTRONICS PARTNER 16 CNC vertical maching center; COLCHESTER TRIUMPH 2000 gap bed engine lathe; HARDINGE DSM-59 high precision lathe; MEUSER M50R 5' radial arm drill; KENT KGS 250 10" X 20" hydraulic surface grinder; DEMAG 2 ton X 36' single girder underslung bridge crane; TOYOTA 52-6FGU45 10000 lbs. LPG forklift; KOMATSU FG25ATL P-12 5000 lbs. LPG forklift; LARGE AMOUNT OF LATE MODEL WOODWORKING EQUIPMENT consisting of: edge banders, CNC routers, automatic panel saws, sliding table panel saws, surface planers, multispindle drills, stroke sanders, dust collectors, belt sanders & more! ; ALSO: (4) air compressors up to 25HP, spot welders, mig and tig welders, plasma cutters & MUCH MORE!